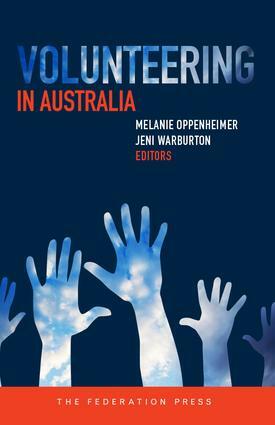 ‘Volunteers and Volunteering, edited by Jeni Warburton and Melanie Oppenheimer, examines the nature of volunteering in Australia, the contexts in which it occurs, and the future role of volunteering, especially in the Third Sector. ‘Volunteers and Volunteering charts the importance of volunteers and volunteering in Australia's history as well as its impact on the political, economic and social fabric. The book explores the impact of volunteers on social policy and practice in what the editors … describe as a policy vacuum. Michael Pusey argues cogently that a 20-year program of economic restructuring has led to the shrinking of government-based support with a consequent "dumping" of the costs of civil society. … Jenny Onyx and Rosemary Leonard explore the impact of social capital on the economic and social functioning of Australian society. … It is worth seeing volunteering in terms of social capital, particularly in order to focus beyond the valuable outcomes it provides in terms of goods and services. Volunteering is more than a cheap form of value-adding, it's part and parcel of the civic values of a society that should be characterised as a caring community.